Liz & I hope you're following the progress of our book, Pop Goes the Library: Using Pop Culture to Connect With Your Whole Community, at the book's blog, but I thought it'd be fun to cross-post a little bit about some book-related updates. 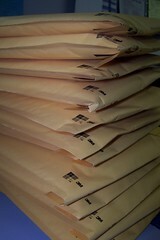 This is a photo of some of the review copies we sent out recently. But wasn't the book published in August, you ask? What took you so long? Well might you ask! There's a story, of course, which you can read here. We've got 3 more comp copies to give away -- if you want one, leave a comment, and we'll pick three random commenters to receive one, signed by Liz & me! Ready? Go! As an instructor in a university program that prepares teachers to be teacher-librarians, I am looking forward to reading your book. My teacher-librarian students, especially those who work in junior and senior high schools, are especially interested in ways to bring teenagers through their doors and engage them with programs, collections, and services that are interesting and appealing to them. Your book seems like it will give them the tools they need to do just that. I have mentioned your book in my courses already and look forward to having time to read it cover to cover and share these ideas with my future students. Your blog has been a good way for me to keep up with pop culture and connecting it with libraries. So, yes, I would look forward to reading the book as well. Congrats. The Los Angeles Public Library desperately needs an infusion of pop culture so that we can keep up with our hip patrons! Please, send us a dose of inspiration in the form of "Pop Goes the Library". I appreciate your comments as a pop culture fanatic and a librarian. Keep up the good work, thank you. We would love a copy of your book. We're always trying new things in pursuit of our ever elusive teens. ooh, I'd love a copy! I've been meaning to track one down, but the busy-ness of work and school have thus far prevented it! I seeing your book all over the blog world - I would LOVE a review copy. I am a youth services librarian and I would THRILLED with this! I love the idea of the book, but I'm curious since I'm here in Scotland how well you think the book would go over in the UK. I'd like to persuade my library to buy a copy but I'm sure they'll raise concerns about it being relevant only to the US. What good stuff can I tell them? Thanks to everyone who's posted so far! Great question, Rachel. When Liz & I were writing the book, we knew we couldn't fully address pop culture in the UK, Canada, Australia & New Zealand without sounding like big phonies, since we're not nearly as well-versed in those specific cultures as we are US pop culture. However, we also wanted to write a book that would be useful to the entire English-speaking world of librarians, so we covered topics that are relevant, no matter where you're practicing: marketing, PR, advocacy and outreach; community needs assessment; collection development; trendspotting. In our massive programming chapter, we focused primarily on events in the US and Canada, but many of the programs we outline -- those observing Veterans'/Remembrance Day, Back to School, Chinese New Year, Gardening, and Oktoberfest -- can all be celebrated anywhere. Likewise, our programs honoring events like The Super Bowl and the Academy Awards can easily be adapted to celebrate events with more UK-specific appeal, such as The Ashes Tournament and the BAFTAs. I hope that sounds promising enough for your librarians! I got my copy in the mail yesterday--thanks so much! I am very much looking forward to reading it. Friday Fun: Think before you post!